Join me and the David Suzuki Foundation on Earth Day and write love letters to nature! And while you’re writing your love letter to nature, sign up for May’s 30×30 Challenge where The David Suzuki Foundation asks people to spend 30 minutes in nature for the 30 days in May. 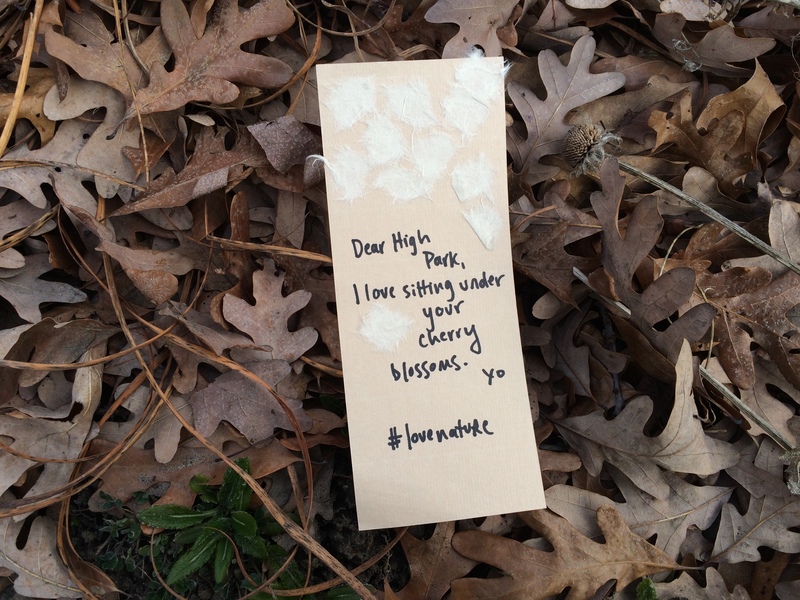 Add your love letter to nature to twitter or Instagram with the hashtag #lovenature and you’ll be entered to win weekly prizes!! After a day, you’ll feel calmer: Spending quiet time in nature lowers your heart rate and reduces cortisol, the stress hormone that makes you feel irritable. A 15-minute walk in the woods can decrease cortisol levels by 16 per cent. After a week, you’ll feel more productive and creative: Time in nature is like meditating. Nature allows the prefrontal cortex — the brain’s command centre — to rest like an overused muscle. It offers inspiring environments that restore our minds, improving productivity and creativity. After a month, you’ll feel happier and more alive: Research shows that people who take the 30×30 challenge experience an increase in positive emotion and vitality over the course of the month. Negative emotions decline and feelings of awe, fascination and curiosity grow. what a lovely project! So simple, so inspired, so beautiful.